Atlanta’s High Museum of Art recently hosted a show covering the art from Picasso to Warhol. My favorite part of art exhibits (aside from trying to get close enough to secretly lay my fingers on the pieces that were crafted by such world-renowned figures) has always been reading between the lines. There were big stories between the lines at this show. In addition to Picasso and Warhol, the show featured a number of other artists including Matisse, Miró, Mondrian, Johns, Pollack, Duchamp and Calder, to name more than just a few. If you happened to read through the exhibit commentary, you may have noticed that a lot of these artists were in the same social circles. It makes total sense, right? Everyone knows that all famous artists hang together. Think again – this is the art of networking at its finest. We are talking about some of the most famous people of our century here. Calder was an engineer-turned-artist. Before he made it big, he became friends with all sorts of noteworthy artists. One of those artists was Marcel Duchamp, who is responsible for dubbing Calder’s giant moving sculptures by the name “mobile.” Later the term was adopted in other industries, one example being with the popular baby mobile. It was quite an accomplishment to have your own personal sculptural style named by Duchamp. That put Calder in a pretty good place. Networking is a common buzzword we hear today, but when we look back in history, we see it is a very old concept. Would Calder have succeeded without the help of Duchamp? Most likely, yes. He had all sorts of friends including the grandniece of Henry James, Miró, Leger, Sweeney, and he even made a visit to Mondrian’s studio where he became inspired to study abstractions. So, yes, Calder probably had the networking and marketing skills to succeed without Duchamp. He may have networked through a slightly different crowd, but he had the people skills, publicity and markets he needed to succeed. A few years ago, I took a 3-hour glass blowing class at Siyeh Glass. 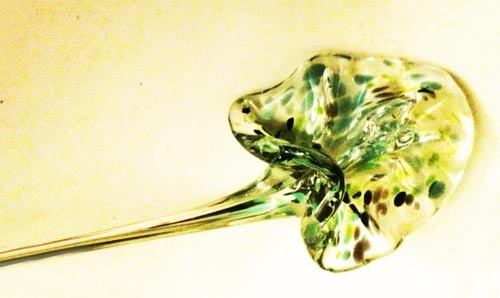 My very first project was a glass flower. You know, like the ones that Dale Chihuly is so famous for, only not nearly as impressive. Chihuly’s flowers are much bigger, bolder, brighter and more beautiful than the ones most artists (or amateurs, for that matter) can make. But is it as surprising to you as it was to me that someone could become as famous as Chihuly by honing in on the VERY FIRST LESSON of a basic glass blowing class? Of course, Chihuly spent a lot of time perfecting his art, but his art does cover the ceiling of the Bellagio. And it’s remarkable to think that he started small, just like everyone else. I asked the glass blowing teacher his thoughts. Is being a successful artist more about good marketing than talent? We both agreed that Chihuly has a lot of talent. His art is on a completely different scale than most, and he’s probably responsible for making the glass flower famous. But there must be others who could have capitalized on similar talents. The difference between Chihuly and the rest of those artists is just a series of lucky coincidences. It was in his intelligence, networking and marketing. That brings me to one question … is luck involved in becoming a successful artist? Think about this. How many local artists have you known and loved? How many of those artists have made it somewhere beyond a stone’s throw away? How many of the others do you think will? There is a lot more than luck in being a successful artist. Perseverance clearly takes talent, dedication, passion and drive. But it also takes intelligence, a good business mind and networking skills. In business and in art, if you’re looking for luck to you carry through, quitting your day job is not probably in your best interest. Why? Because it’s all in the marketing. Luck comes to everyone, but it takes a special type of person to actually recognize it and jump on the opportunities that come along with it.